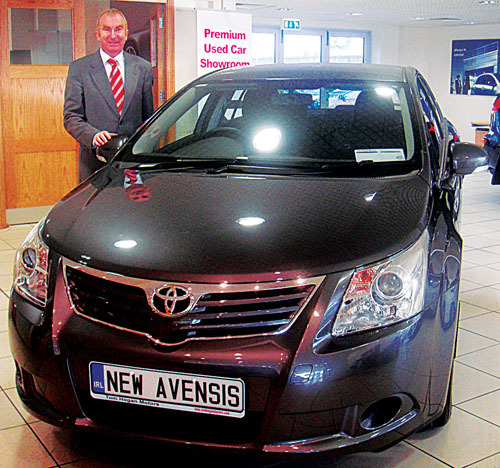 Tony Burke, dealer principal at Tom Hogan Motors, Ballybrit, with the new Toyota Avensis. Both the new iQ minicar and new Avensis are now showing in the showrooms at Ballybrit. Toyota has just launched two new models to the Irish market. The iQ is a radically new model that takes minicars to a new level, while the third generation Avensis is the evolution that existing owners will want. The new Avensis has been designed, engineered, and built in Europe. It projects a more athletic and sleek design than the model from which it takes over. It has more substance and is also more dynamic looking. The new model features more powerful and cleaner engines, and it emits less CO2, which Toyota Avensis points out is the only D segment petrol vehicle within the C band for road tax in Ireland. The innovative power of the top Japanese carmaker has been applied to the third generation Avensis through a powerful new range of petrol engines, upgraded diesel engines, and advanced new transmissions. Toyota's optimal drive technology combines to offer customers reduced emissions and fuel consumption, yet without compromising on power and driving pleasure. Avensis has always been one of the safest cars in its segment with a five star Euro NCAP rating from its original test, back in 2003. A major requirement in the development of the Avensis was to once again present a car with an advanced safety level. With seven airbags and active front seat headrests the new Avensis is engineered to achieve five-stars in the even more stringent 2009 Euro NCAP rating. The entry level 1.6 litre Valvematic Terra petrol saloon sells for €25,565 (incl 20 per cent VRT + 21.5 per cent VAT ) with the D-4D 2.0 Litre (125bhp ) Terra diesel saloon selling for €26,015 (incl 16 per cent VRT + 21.5 per cent VAT ). The iQ is a revolutionary new car that Toyota says strengthens its position to offer exciting and desirable vehicles with low fuel consumption and emissions. Toyota expects iQ to attract many new customers to the Toyota brand through the car’s breakthrough design, packaging, and driving dynamics. The radical iQ design represents simple, bold, forward-looking Japanese design approaches. To achieve a refined feel meticulous attention was paid to the quality finish of interior and exterior details. The iQ is small in size, but, unlike a small car, possesses a confident on-road appearance. You get drivability and feedback similar to that of a bigger car. This high level of innovative driving dynamics has been achieved by a combination of a new platform, innovative suspension/steering and leading-edge aerodynamics. A host of engineering breakthroughs have been combined to make iQ the world’s smallest four-seat car, including six major space-saving innovations. Toyota sees the iQ as an ‘engineering jewel’ capable of radically changing consumer opinion on small cars. The iQ offers quick and nimble handling in urban environments with an extremely small turning radius of 3.9 metres, and a level of motorway stability previously unimaginable for a vehicle of its size. The new iQ 1.0 litre three-door Strata sells for €14,410 (incl 14 per cent VRT + 21.5 per cent VAT ). Also available soon will be the two-seater version Strata for €13,690 (incl 20 per cent VRT + 14 per cent VAT ). Commenting at the launch of the two important new models, Dave Shannon, MD of Toyota Ireland said: “We at Toyota Ireland are very excited about the launch of these two great new products in the Irish market. Avensis is a core model in the Toyota line-up and continues to be a leading player in the D segment in Ireland, achieving number one sales in the segment for 22 out of the last 24 years. The new Avensis is a super evolution and the all-new iQ is revolutionary. Check them out.